Another year has been and gone! Can you believe it? 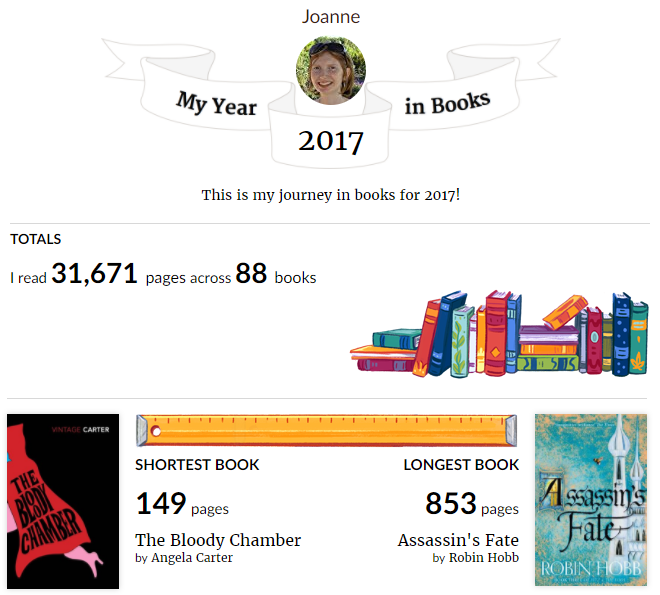 As I do each year, I'm going to look back over the blog and my reading from 2017, and look forward to what I'm looking forward to next year! I read 88 books in total this year; 84 novels (adult, YA and MG) 2 books of poetry, and 2 non-fiction books. I read a lot more than I did last year, so I'm quite happy with that. This year I decided to track where the authors who wrote the books I read were based. Obviously, US authors are who I primary read. I would like to read more books by people in different parts of the world, though. And also more translations. I read 88 books in total this year, 84 of which were fiction, and 2 poetry. Of the 86 novels and books of poetry I read this year, 67 were diverse books in one way or another. I think it's important to say that, although I read 19 books that I'm considering privileged books, 14 of them were fantasy novels, with created races. I've counted them as privileged books, because it's not always clear - to me, anyway - if the races the author has made up are actually people of colour, or just white people living in different places. So I could be wrong here, and these 14 books do feature people of colour, but if that's the case, and I'm not picking up on it? Then perhaps the authors should do better. 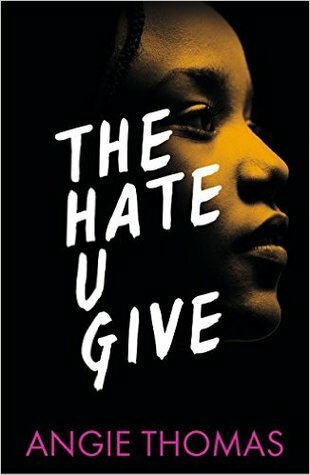 Now on to the actual diverse books. 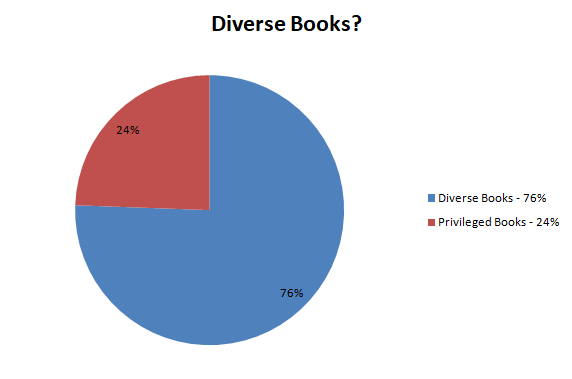 As I said above, I read 67 diverse books, but of these I neglected to include in my record of diverse books read, and these pie charts were made before I realised that. Even so, the pie charts aren't too far off. 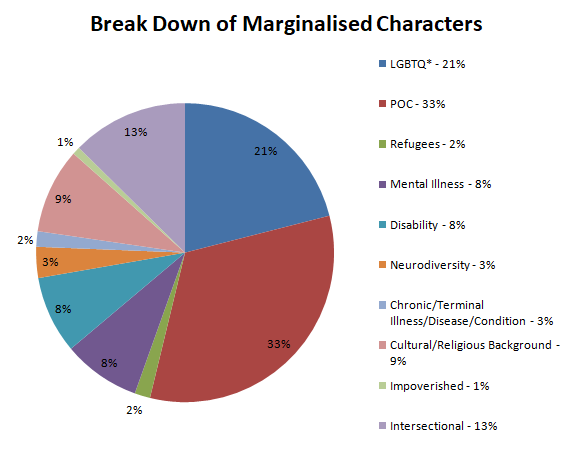 The above pie chart looks pretty good, but it counts all books that feature a character from a marginalised group, including secondary characters. The below pie chart shows how this breaks down into main characters and secondary characters. It should be noted that books featuring marginalised secondary characters where the main character is also marginalised are counted only in the MC stats. The SC stats are for books that feature privileged MCs. Doesn't look quite as impressive this time, does it? I'm doing fairly well for POC and LGBTQ* main characters, but not as well with everything else. 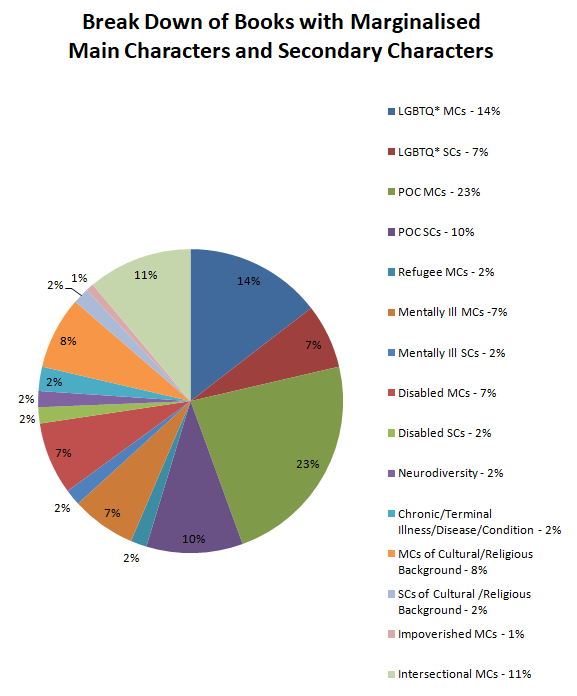 I think I'll continue to record books with secondary characters, but I'll create two separate pie charts next year - one for MCs and one for SCs. 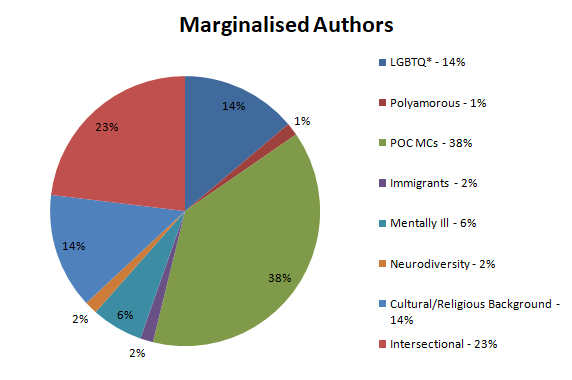 This chart shows authors whose books I've read who are open about their marginalisations - I may have read books by more authors from marginalised groups, as not all authors are open about their marginalisations. 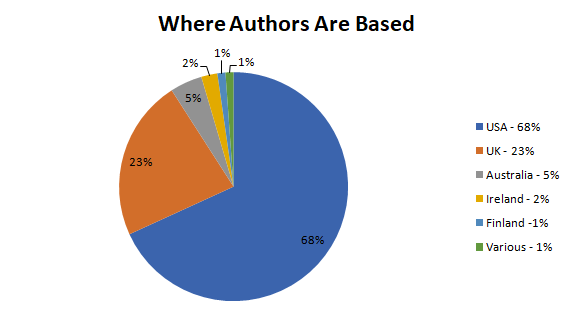 As above, this chart shows the number of #OwnVoices books read where the authors are open about sharing their characters' marginalisations. So, how well or badly did I do in meeting the Diverse Reading Goals I set myself at the beginning of the year? 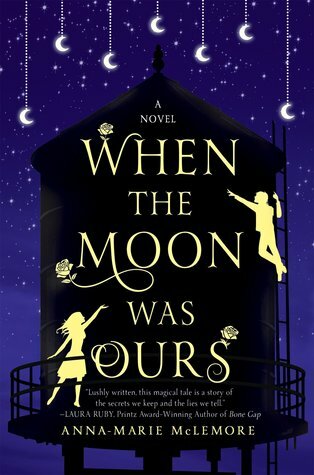 Goal: To read more novels with disabled characters as protagonists. - Last year, I read 6. This year, I read 10 books with disabled characters, but only 8 with had disabled protagonists. However, two of those 8 were sequels, so it was the same character twice. So only 6 protagonists. So, really, I only met what I read last year. Need to do better in 2018, because 10 in itself isn't great. 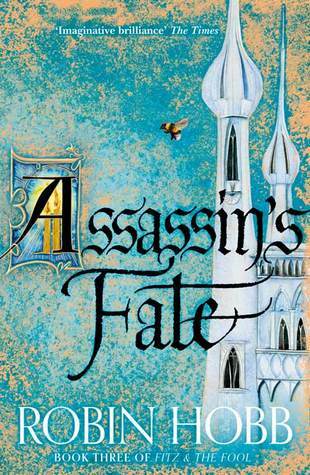 Goal: To read more novels with characters who have chronic illnesses as protagonists. - Last year, I read 1. This year I read 3 books with protagonists who had a chronic or terminal illness/disease/condition. So I improved, but not by nearly enough. 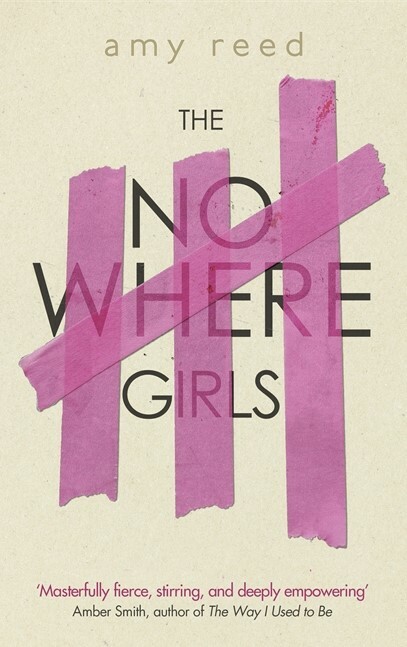 Goal: To read more novels with characters who identify as the lesser represented LGBTQ identities as protagonists. - Last year I read only 2 books that fit this. This year, in total, I read 13 books altogether with the lesser represented LGBTQ identities, but 8 with protagonists with those identities. This breaks down to 2 books with trans protagonists, and 6 books with bisexual protagonists. 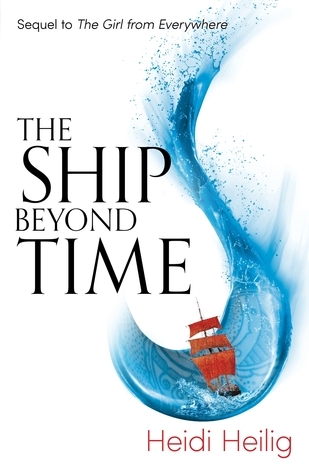 I also read 1 book with a non-binary secondary character, 3 books with bisexual secondary characters, 1 book with an intersex secondary character, and also, one of the books with a bisexual protagonist also featured a pansexual secondary character. I did do better, but it's still quite low. Want to up this next year. 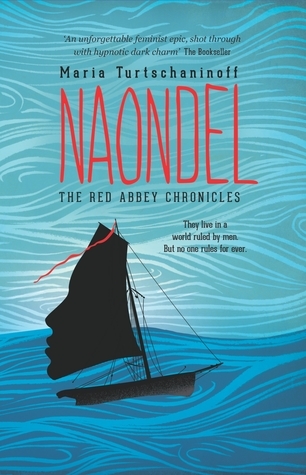 Goal: To continue to seek out more novels featuring people of colour as protagonists. - Last year, I read 13. This year, I read 39 with POC charaters, but 29 with POC protagonists. A massive improvement, and one I'm quite pleased with. I'd like to continue to do this well next year. Goal: To continue to seek out more #OwnVoices novels. - Last year, I read 13. This year, 17. An improvement, but not much of an improvement. However, this is based on information that is publicly known, and authors do not need to declare their marginalisations. I may have read more and don't know about it. My thoughts on this kind of goal are still developing. Goal: To read more novels with characters from cultural and/or religious backgrounds. - I didn't read any last year. This year, I read 11 in general, 9 with protagonists from a cultural/religious background. This was mainly down to the Muslim Readathon that was held in May, in which I read 6 of which featured Muslim characters (10 books by Muslim authors overall). 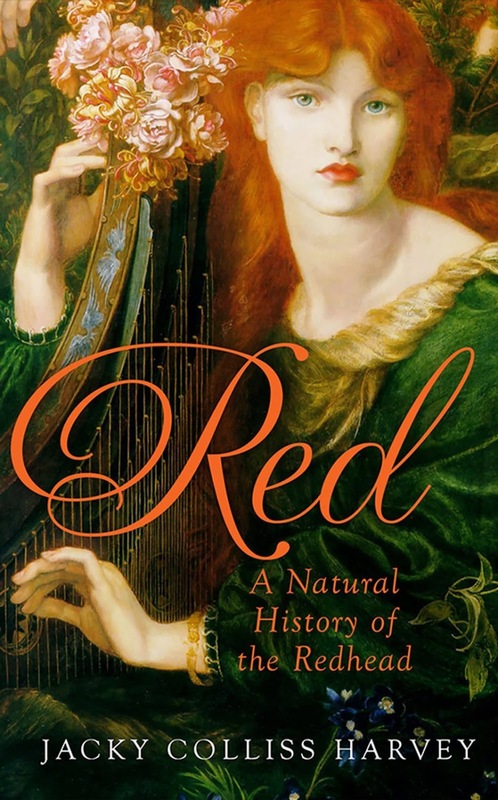 I read 1 book with with a Jewish protagonist, which also featured a Romani protagonist, 1 book with Quaker protagonist, 1 book with a Hindu protagonist. There's not a great diversity there. I would really like to do better next year. Goal: To read more novels by authors from marginalised backgrounds in general (not necessarily #OwnVoices). 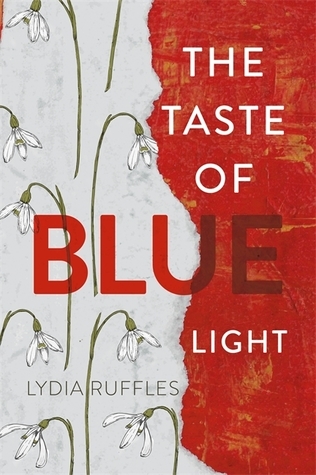 - I read books by 19 marginalised authors last year. This year, I read books by 30 marginalised authors (in both instances, I read several books written by the same author, for a number of authors.) It seems kind of low, still, for me? I mean, 86 books read in total, and only 30 of them were by marginalised authors? At least, that I know of. I'd like to read more - but at the same time, I need to realise that not all authors are public about the marginalised groups they belong to. The only thing I can really be sure of is marginalised characters, so I don't think I want to beat myself up too much about marginalised authors. But maybe read more books by authors I know to be from marginalised groups. I'm still going to think about this and my #OwnVoices goal. I did pretty well in 2017 in upping the number of eProofs I read. 30 of the 88 books I read were NetGalley eProofs, which is a huge increase in what I normally do. 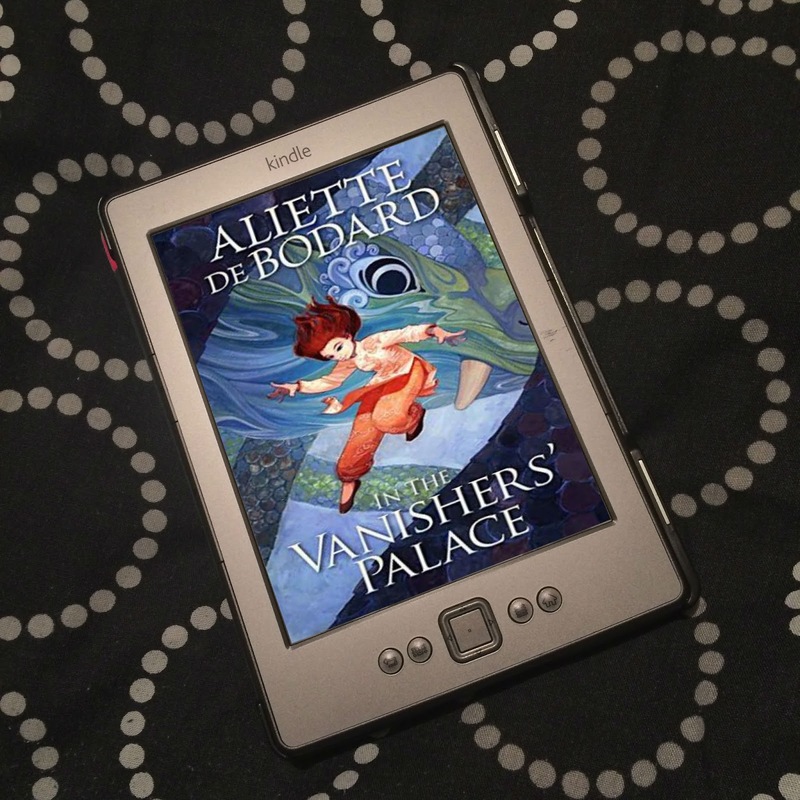 I've also requested eProofs over physical books wherever possible, too. I've got my Feedback Ratio up to 63% - I've still got a way to go, but I think I can do it, especially as I read much faster when I read on my Kindle. I really want to continue this improvement next year, because I still have too many physical books and not enough room for them. I still need to cull a lot, and I mostly know what I want to cull, it's just getting the boxes for them, and getting them donated. I'm still working on my Diverse Reading Goals for 2018 - I will update a post with a link once they're sorted. However, I really want to think about my goals surrounding marginalised authors. 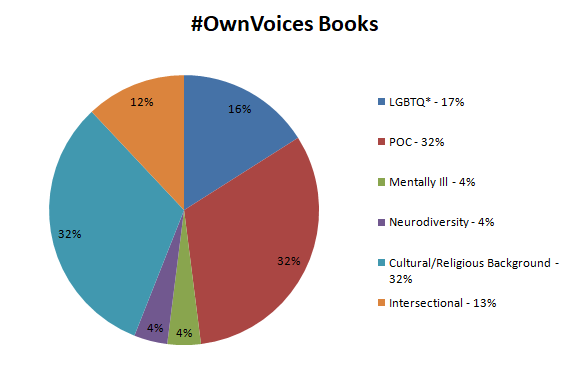 Over the year, there has been discussion on Twitter about how #OwnVoices has been distorted. As I've said, Authors do not need to declare, and shouldn't be made to feel they have to declare, their marginalisations. I think I will record when I know a book is #OwnVoices, but I don't know if I will specifically seek them out this time. I think I'll keep going for books by marginalised authors, but not focus so much on whether or not they're #OwnVoices, but also try to place as much importance, in my mind, on diverse books by authors who may seem to be writing outside their own lane. We need privileged authors to write about people unlike them as they are published more often than those who aren't marginalised - but we won't necessarily know whether a seemingly privileged author is writing in their own lane. #OwnVoices novels are important in regards to knowing there will be good rep, but non-#OwnVoices novels don't necessarily mean bad rep - especially with the rise of sensitivity readers. So yeah, this is something I want to think about when I set my goals. When thinking about my goals, I need to remember the kind of reader I am. I'm not the fastest of readers. When people are reading 200+ books a year, every year I've been blogging, I've failed to meet 100. So it's about trying to make as many as possible of those <100 books diverse books. If I'm focusing on specific marginalised groups, books featuring other marginalised groups may not make as many of my total. I think the way to get around this is to try to have the majority of the diverse books I read feature intersectional characters. I'll also be maintaining a Diverse YA & MG 2018 UK Releases, so you guys can see what diverse books are being published in the UK. 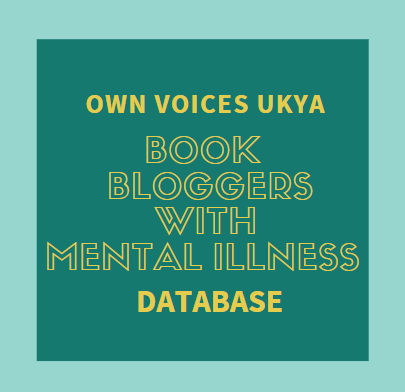 It is my plan to run a themed event in May 2018 on mental illness in YA. I have a mental illness, as do a number of important people in my life, and I'd like to put some real focus on it. And it's been a while since I held my last themed month. 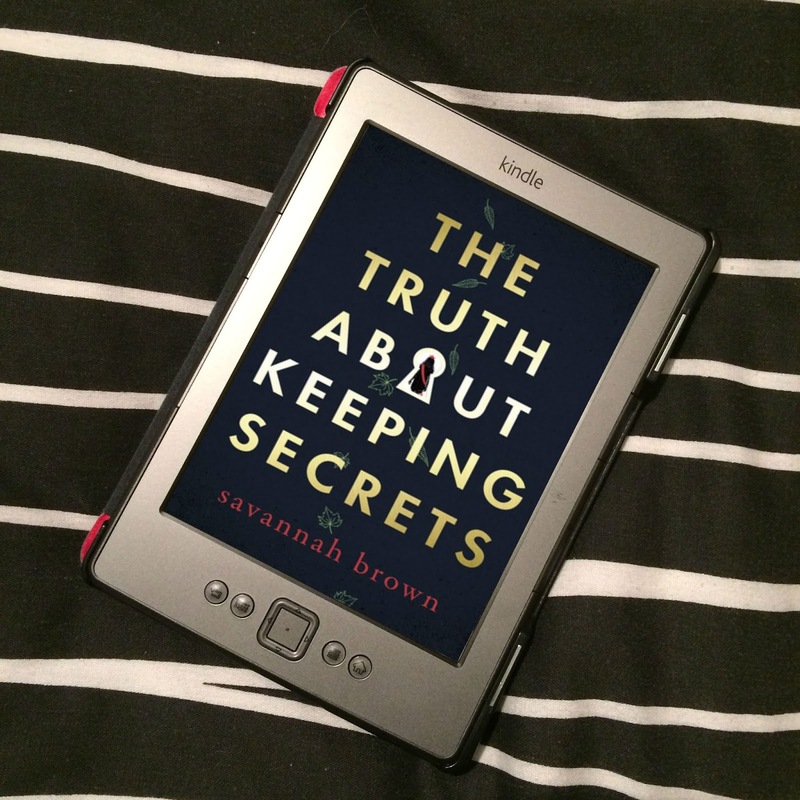 There's still a lot of planning underway, but there are a number of bloggers who are already on board for taking part, and I'm hoping to interview some authors, as well as the normal reviews from me on the blog. I'm really looking forward to it, and I'm hoping it will be a success. I will be taking part in the 2018 Debut Author Challenge, the British Book Challenge 2018, and the 2018 NetGalley & Edelweiss Reading Challenge, all of which I completed this year. I'm also taking part in the What's In a Name? Reading Challenge 2018, which I didn't complete this year. Again, I'm taking part in the 2018 Book Blog Discussion Reading Challenge, which I didn't complete this year - I was one away from 11, but I want to get closer to 20 this year. I'm not going to be hosting the Retellings Reading Challenge this year. It became too much work and too much money for how few people were taking part. 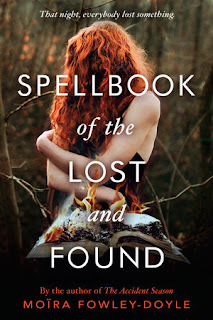 I will still be reading retellings, and I believe I will continue to set my own personal challenge for reading retellings, as I can't seem to find another retellings reading challenge of any kind for 2018, but that will just be for me. I will be challenging myself on a few things this year. 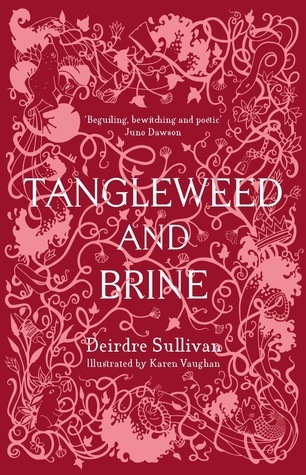 I want to read books by authors from different parts of the world, and I'd also like to read more translations - sometimes these will overlap, but I may read books from other English speaking countries, like Australia. I think I'd also like to read books set in different parts of the world, too, so I'll also be keeping a track of those. There's no Read the Books You Buy challenge this year, but I'll also be keeping a record of the books I buy so I can track how many of them I read, too. How was your 2017 reading? What are your plans for 2018? Love how you broke everything down with the charts! 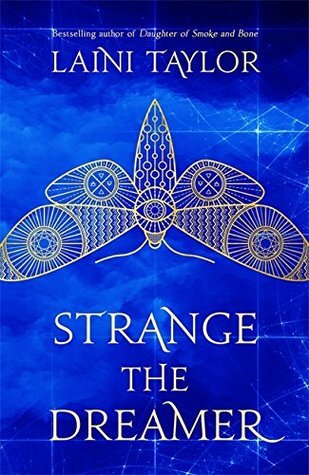 I read Strange the Dreamer and THUG too - and loved both!